Every once in a while I feel inspired to create a little tool to "do one thing" (tm). But often I get distracted and a little too lazy to get off the ground and forget all about it. So I thought maybe a little helper can, well, help move things along. Enter FAIL, short for File API Input Layer (yup, totally made up to match the acronym). FAIL doesn't do anything with the images, it's the job of the future tools that could be using it. FAIL is written in React. I'm probably still a little old-school and when I have an idea I create a blank test.html and go from there, vanilla-like. But in this case I decided to go against my lazy-bum instinct and use something that can get me off the ground. And allow me to write all the ES2019 I want. Even though this means dreaded SETUP. I hate setting stuff up, kills the mood 🙂 But in this case turns out React is just perfect for this type of tool. I couldn't be bothered with Redux or whatever though, not even my self-grown DIY flux implementation. That would be too much. 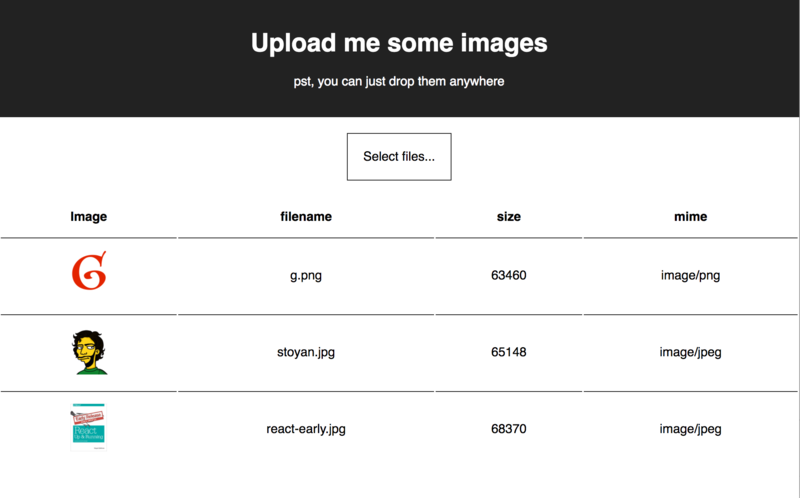 Now Uploads and Results are even simpler. They just render something. They don't need to maintain state. So they can be implemented as stateless functional components. If you're not familiar with those see this diff where I switched from ES class syntax to functional components. As you can see all we need to do is maintain the list of files in the state and all comes to place. The constructor also takes care of setting up drag-drop listeners. Once again - code and demo. I'd be thrilled if anyone uses this as a jumping point to create different tools. We can never have too many tools!